What if I told you that one tiny little change in your kitchen could save you up to 60% off select items on your grocery bill? Would you want to know what the secret was? Or would you turn a blind eye and be content with spending too much on real food? Cooking beans from scratch is one of those real food tasks that’s kinda boring. I mean, have you ever seen anyone get excited about eating beans? I definitely haven’t, but it’s a sad story really. Beans have so much to offer! And I’m NOT talking about the unpleasant, digestive side effects. Ahem. 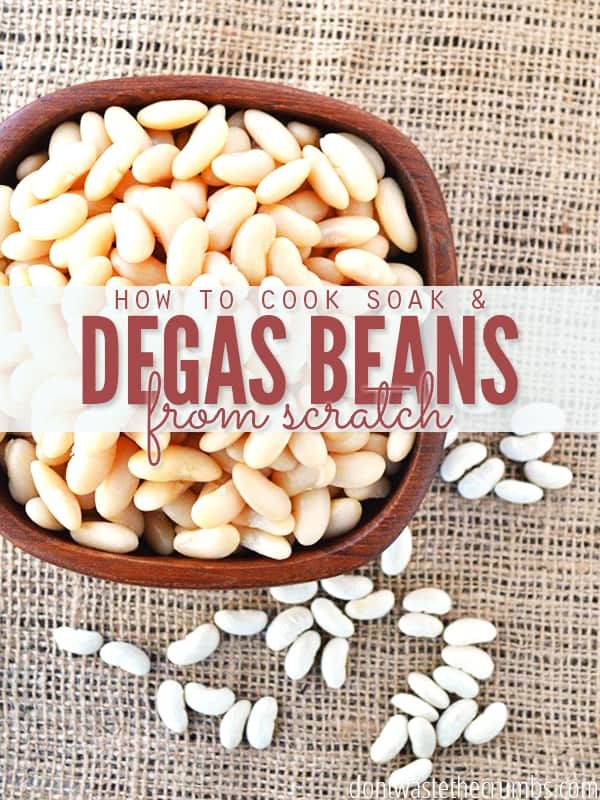 Actually, there’s a really easy way to “de-gas” beans, so to speak, so you don’t have to deal with that. First and foremost though, let’s talk about nutrition. Holy smokes! 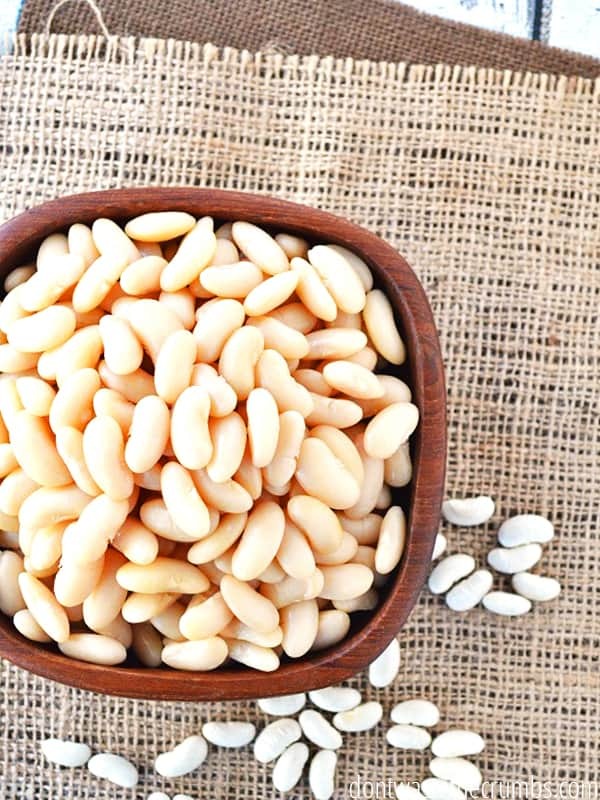 Name the bean and the odds are in favor that it provides a substantial chunk of your daily vitamins and minerals. Folic acid, fiber, iron… even the trace minerals like copper, manganese and magnesium that most of us don’t get quite enough of are found in those tiny little gems. To top if off, beans are frugal. Really, really, REALLY frugal. I’ve found beans as low as 99¢ per pound locally, but if you have the room, you can get them for even less when you buy in bulk. So, are there any downsides to the great and amazing bean? I can only think of two. 1. You have to purposefully include them in your meals. Until that happens, I try to incorporate beans at least once a week in our meal plans. 2. They tend to produce unpleasant, smelly side effects for some people. There’s a reason why they’re called the magical fruit… if you know what I mean. Fortunately, I have a fix for that too. Some people would claim that there’s a third downside to beans… That they take too long to cook from scratch, and it’s easier to open up a can when it comes time to make dinner. With a little bit of planning (and we’re really talking just a little, teeny tiny bit here), you can have both the convenience of canned beans AND the benefits that soaked beans provides (i.e. less gas). Allow me to share how we cook beans from scratch to stretch the budget, eliminate the cause of foul-smelling gas and how we do it all each month without thwarting dinner plans. Place beans in a colander and rinse well. Remove any whole or partial beans that are significantly discolored. You also want to check for pebbles and clumps of dirt. Unless you want to eat pebbles and dirt, but I don’t recommend it. Measure beans into a large stock pot. Add 4 cups of water for every 1 cup of beans. One pound of dry beans yields 3-5 cups, depending on the size of beans, so you’ll need anywhere from 3-5 quarts of water. It’s okay to overestimate if you don’t feel like measuring, but don’t underestimate otherwise you’re going to run into problems. I usually take the 30 seconds and measure, just to be safe. If you’re making black beans, add 1 Tbsp whey or lemon juice for each cup of dry beans. All other beans are good with just water. Allow the beans to sit undisturbed for at least 8 hours, or up to 24. After soaking, strain beans into the colander and rinse very, very well with cold water. This step is pivotal in removing the enzymes that cause the gaseous side effects. Tip: Consider saving the soaking water to water your garden for free. Return the beans to the stock pot and add the same amount of water you originally used, plus an extra cup for each cup of beans. For example, if you started with 2 cups of beans, you’ll need 2 quarts (4 cups water per 1 cup beans) + 2 cups more. Place the beans on the stove top and bring the water just to a boil. Stir, turn off the heat and cover the pot of beans with a lid. Allow the beans to sit undisturbed, for 2-8 hours. Strain beans into the colander and again, rinse very, very well with cold water. If you haven’t guessed, the draining and rinsing of the beans is the all-important step in de-gassing the beans. You must eliminate the soaking liquid and rinse off the residue from the beans. Don’t get lazy otherwise you’ll pay later! Tip: Again, consider saving this soaking water too for watering the garden for free! Periodically check the beans for doneness and add more water as needed to ensure the beans do not dry out while cooking. Season with salt and pepper to taste when the beans are almost done. Feel free to add additional seasonings too, like garlic, onion, cumin or Italian seasoning. If you don’t want to cook the beans on the stove-top, here’s how I cook beans in a slow cooker or in the Instant Pot. Drain and allow the beans to cool before storing. Place beans in a colander and rinse well. Remove any whole or partial beans that are significantly discolored. You also want to check for pebbles and clumps of dirt. Measure beans into a large stock pot. Add 4 cups of water for every 1 cup of beans. One pound of dry beans yields 3-5 cups, depending on the beans, so you'll need approximately 3-5 quarts of water. If you're making black beans, add 1 Tbsp whey or lemon juice for each cup of dry beans. After soaking, strain beans into the colander and rinse very, very well with cold water. Return the beans to the stock pot and add the same amount of water you originally used, plus an extra cup for each cup of beans. Place the beans on the stove top and bring the water just to a boil. Turn off the heat and cover the beans. Allow the beans to sit undisturbed, for 2-8 hours. Strain beans into the colander and again, rinse very, very well with cold water. Return the beans to the stock pot and cover with water so that the water line is at least 2" above the beans. Bring the beans to a very low simmer and allow them to cook until desired tenderness. For partially-cooked beans, this will take anywhere from 45-90 minutes. For fully-cooked beans, this will take anywhere from 45 minutes to 2 hours. Periodically check the beans for doneness and add more water as needed to ensure the beans do not dry out while cooking. Season with salt and pepper to taste when the beans are almost done. There are a few things that I do at the beginning of each month that helps to make cooking real food easier. One of those is cooking all the beans I need for the entire month, in one mega batch, and freezing in 1 1/2 cup portions. The steps above sound like a lot, but much of it is hands off. In fact, there is practically no work involved in entire bean process until the beans are actually cooking, which happens in the last 2 hours. Since I am a stay-at-home mom, I can soak and cook beans any day of the week. Simply start one morning and the beans are ready the following evening. It’s not uncommon to have pots full of black beans, white beans and garbanzo beans (the three I use most often) all going at one time. If you’re soaking and cooking one, you might as well be soaking and cooking three, right? However, if you work outside the home, start this process on a Friday night before you go to bed. When you wake up on Saturday, start the second soaking process. Then when you start to prepare dinner that night, start cooking the beans. The beans will be done when everyone is done eating and cool enough to measure and store before you go to bed. If it works better for you, start the process on a Saturday night instead. For that matter, since you don’t have to actually be there until the very end, you can start this any night before you go to bed. While you’re preparing lunches or breakfast the next morning, bring the beans to a boil and turn off and cover. Then cook them when you get home. Compare that to a single can of beans that can cost anywhere from $0.50-$1.20 each! You can read my full write up comparing dry beans vs canned beans HERE! I should note that not all brands of beans are created equal. The lower priced brands often include more broken beans, debris or non-uniformly cooking (or looking) beans than the higher priced brands. Once I bought a bag of beans from a non-mainstream brand and had to throw away almost a third of the beans because I felt uncomfortable feeding them to my family, they were so discolored. You might pay less money with some brands, but you could be getting less beans (like in my situation). The better quality brands will have less debris, if any at all, meaning you’re actually getting what you paid for. Judging the quality of a product, and not just the price, is something I’m learning as we venture this whole budget thing. At least beans aren’t something to be too concerned with in terms of buying organic. Just pay attention when you’re rinsing and sorting your beans and adjust your purchases as necessary. 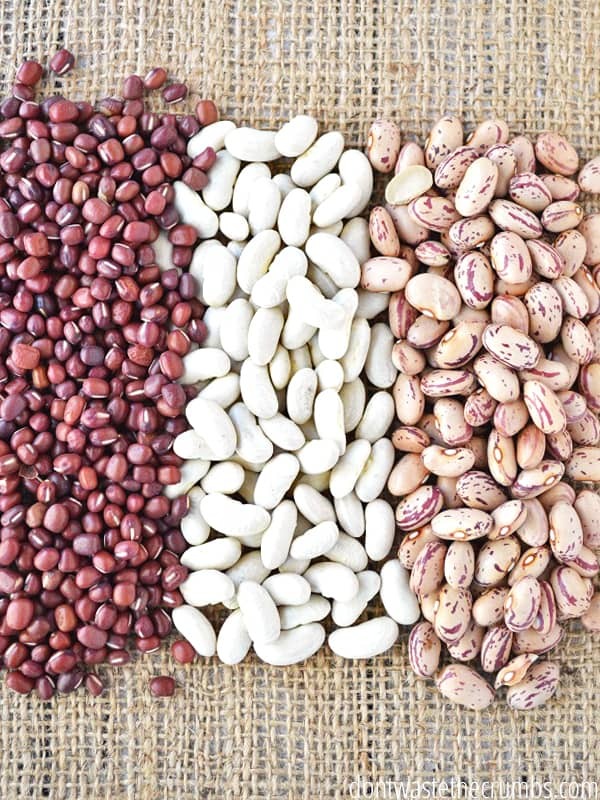 Beans are an EXCELLENT frugal protein source! Cooking beans from scratch will save you money: see my price comparison to canned beans HERE. 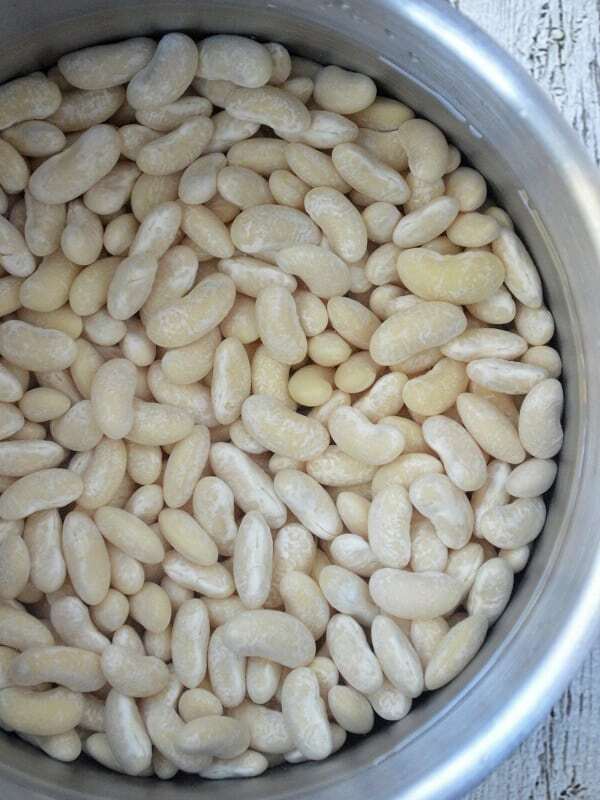 You can easily de-gas beans by soaking first. Cook them on the stove top (like in the recipe above), in the slow cooker, or even the Instant Pot (you don’t have to soak first with the Instant Pot!). Use beans to make black bean brownies, white bean blondies, dessert hummus, tortilla soup, or make refried beans! I even add them to boost the protein in smoothies. Do you cook beans from scratch, or do you prefer to buy canned? How often do you incorporate beans into your meal plan? Disclosure: This post is sponsored by Bob’s Red Mill. I love Bob’s Red Mill products and used them often in my kitchen, long before this blog was born. As always, I would never recommend anything on Crumbs that I wouldn’t recommend to a close friend or neighbor, and all opinions here are my own. I definitely agree that home-cooked beans taste a lot better. Once I started cooking them myself rather than buying canned, on the occasions when I do buy canned last-minute, neither my husband or I like the texture very much. They always taste kind of undercooked to me. I like your comments on how to work this long process into your schedule if you work. One thing I find with slower techniques, e.g. making sourdough bread, is that the longer waiting times sound prohibitive initially, but in reality I find them much easier to work around a normal schedule. When I was working full time, I used to prepare sourdough bread on a Saturday afternoon, let it rise all night, and then bake it while we ate breakfast on Sunday morning. Actually that was much easier than trying to carve out 3 or so consecutive hours to make ordinary quick-rising yeast bread. And because everything is slow, an hour’s give or take doesn’t make so much difference. I find that with beans as well. There’s no rushing it, but the upside is that it’s a lot more forgiving and flexible than some quicker processes are. Yes! The fact that “it takes days” is a huge turn off, but when you really sit and think about the work involved, not just the time, we realize that it’s not as bad as we originally thought. Even favorable, as you’ve mentioned. I forgot the flexibility that sourdough provides… I need to get that going again!! Yay beans! My method is a little bit different, but it’s also really easy. After dinner, dump the dry beans in the crockpot insert and cover with cold water. Let soak overnight. Drain and rinse in the morning, and cover with water (plus an extra few inches) and cook on low all day or high for about 6 hours. Easy peasy! Or if I’m making a soup that includes beans, as long as I soak them overnight, I’ll just let them cook with everything else in the crockpot all day, but maybe add a bit of extra broth or water. I’m a stay-at-home/homeschooling mom, so I’m around all day to check on the moisture level if I need to, but I’ve done it enough that I can eyeball it now. I like your method too Katherine- especially the one where they just keep on cooking for dinner, lol. Anything that makes work easier gets two thumbs up from me! Thanks so much for sharing your ideas with us! Thats a new way for me.normally i just soak the beans days at a time changing the water when it starts getting slimy.when im ready I cook the beans on simmer till done with a pinch of bicarb soda. Can’t wait to try this method to compare. I just put pinto beans into soak. It is so much cheaper to make my own, and we love refried beans. I also use my crock pot to cook my beans, but I do my soaks in a stock pot, because it takes up less space, and my counter space is limited. Thanks for the tips. Thanks so much for the tip on saving space Brooke! I love using a slow cooker, but we’re limited on counter space too. Dividing the task is a great idea! What are your recommendations for storing the soaked beans? I’ve tried this a couple of times but got bogged down at the storage step and went back to cans because they are easier to keep on hand, ready when I need them. We eat beans a few times a week so the savings you mentioned sounds like a good reason to try the soaking process again. Hi Alana! Once the beans are cooked, I strain them and measure out approximately 1 1/2 cups into a sandwich baggie. Then label, push out the air and freeze. At the beginning of the week, I move what I need from the freezer to the fridge and that’s it! To save freezer space, you could also dehydrate them and microwave in hot water to rehydrate. Ideal solution for single households! How do you dehydrate them? How long do you cook them? Thank you Tiffany! I didn’t know about the 2nd soaking. I also make beans all at once and while I was soaking for 24 hours and rinsing, they were not completely de-gassed. Now I know!! Beans freeze very well. 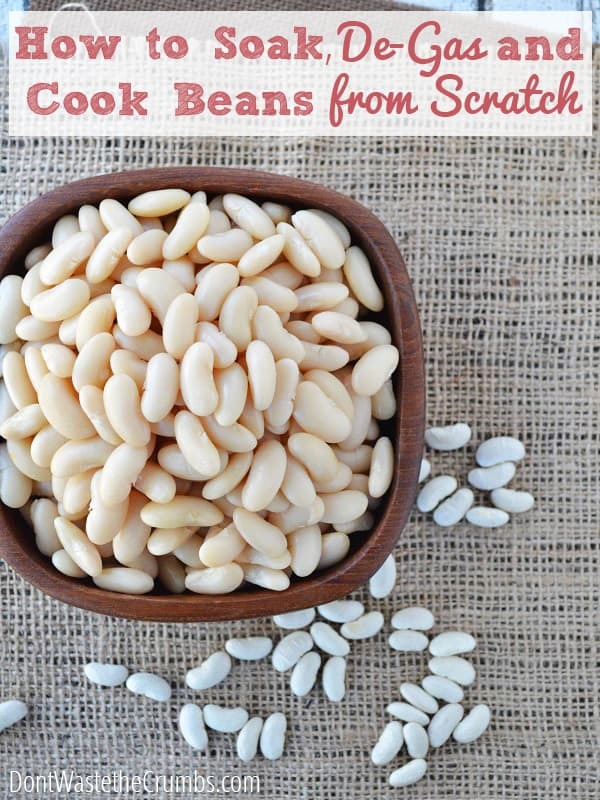 Tiffany-thank you for sharing how to make beans from scratch. They sound easy and yummy! I have loved your website and inspired me to budget our grocery budget. So, for my first time on a tight budget I spent $150.00 to feed a family of five breakfast, lunch, dinner and health snacks for two weeks. I bought as much as I could with organic. My family loved having all the food and meals made. Thank you for all your tips and ideas I could not have done it with out your help. Thank you! Amazing job on your budget Shelly – that’s incredible! Thank you so much for taking the time to leave me this incredibly encouraging note. Thank you, thank you, THANK YOU! I’m honored to be able to share with you guys, and I’m humbled each day at the response. Blessings to you and your family! Hi Monkey’s Mommy-I make scrabbled eggs or omelets with lots of left over veggies and cheese. It’s amazing how much I can find of a little bit of this and a little bit of that to make the omelets. Also, my husband loves left over pinto beans with eggs. I bought a 10 pound bag of oatmeal for $6.00. I made oatmeal “Starbuck style” with crushed nuts, seeds, dried cranberries, raisin, and made granola bars about 4 batches. Only used about a quarter of the oatmeal. I made the homemade yogurt with fresh fruit and crumbled up granola bar with nuts and seeds. Our family favorite was the Quiche with a Super Easy Whole-Wheat Crust. It’s great that with your busy schedules you still make a meal together. Just another tip here, I make steel cut oats at night, here’s how; boil the amount of water or milk (I use almond milk) you need, add the amount of oats, then take off the heat and cover tightly, I put foil under the lid as my lid doesn’t fit as tight as it used to. Before you add the oats I add different dried fruits, seeds etc then the oats. Let it sit all night and it’s done in the morning. You might have to add some liquid if it’s too thick for your liking. It sure beats trying to cook something for 40 + minutes in the morning. I usually make enough for a few days, just refrigerate and heat as needed. As for the beans!! I soak mine exactly as you do, and I do tons at a time. I cook a bunch and freeze for meals, but I also freeze some in quarter cup portions to add to smoothies in the morning for a early protein burst. I also freeze some that are soaked but not boiled and the are ready to cook when I need them. Hope these ideas help…sorry I’m a year late posting lol 🙂 just clicked here from another site. They absolutely do, and better late than never Deidre! We are big bean eaters. It is definitely a cost-saver, plus healthy. And, since I work outside the home, I find beans an easy basis for planning meals. For example: Meal 1 might be beans & rice with salad; Meal 2 chili with the leftover beans; Meal 3 burritos or chili mac with the leftover chili. I also rotate the bean for the month. For example week 1 – pintos. Week 2 – red beans. Week 3 – black beans. Week 4 – lentils, split peas, or refried beans. This really helps with the variety because each bean “goes” with different types of meals better. My husband isn’t a huge black bean eater, but because I pair it with fajitas, he enjoys the meal. One thing you didn’t explicitly say but new bean cookers need to know: Do NOT add salt before the beans are done. They will never finish! I do have a question: Why do you have to add whey or lemon juice to black beans? I cook them all the time and never heard of this step – so please educate me. I think that the acids (whey, lime juice, etc) are added to help break down what some people call the “anti-nutrients” in beans. I haven’t tried this myself, and also haven’t tried the double soaking method. I soak them just once overnight with salt. We do eat a lot of beans and I think that alone helps cut down on unpleasant side effects. But next time I make beans, I’ll give it a shot. I have to disagree with not adding salt. On the advice of Cooks Illustrated, I started adding salt to both the soaking water and the cooking water for beans and it made a real and wonderful difference in the texture. The beans end up both creamier and more intact with the salt. It does not add to the cooking time at all. I’ve never tried adding salt, since I always thought it was for taste, not texture. I’ll have to give this a try next time. Thanks for the tip! Hi Rosa! I somehow missed your original comment, but better late than never! Thanks for the tip on the salt, and the whey/acid is added in order to neutralize the acid in the bean. Some beans need it, some don’t. Adding it to black beans in particular should aid in digestion. would vinegar work instead of lemon juice? I have decided to be adventurous and try new things – including beans and lentils (both of which I say I hate, but actually ate for several months while in another country and never died or anything). So when I was at the store last week, I was looking at cans of beans. But when I was picking up my rice, I noticed the pretty dried beans and how much cheaper they were than canned. So I traded them off for a bag of garbanzo beans (with the goal to make safe hummus) and a bag of lentils. But when I got home, I realized there was probably some secret to making these dried things into smushable chickpeas and edible lentils – and I didn’t know the secret! Now I do though, and I can’t wait to make my own hummus! PS: Does this work for lentils? Yes, it does work for lentils, although you don’t have to soak nearly as long. I always eat a bean after each soak, just to gauge how much longer it will be. Do the same for lentils. The first soak will be normal, but the second might be short. They’re not as big as most beans, so the process works much quicker. ohmygoodness! I thought I was the only one who bothered to remove the membrane off of garbanzo beans!!! LOL! My chef hubby thinks I’m silly to take the time, but anything with garbanzo beans tastes better. His other thought is that you’re losing the fiber that comes with the outer coating?? But the texture is SO much better! And, thanks for the great tips, Tiffany! I also enjoy reading people’s comments to get more info too. 🙂 What a great blog!!!! If you remove the skins. Do you have to do each bean?? Or will they come off & float so you can skim them off?? You do KelliBoo, but this is only for garbanzo beans. You can either enlist the kids to help, or put them in a bowl of water and swirl somewhat vigorously with your hands and the skins will start to come off on their own. Eating one raw bean might be OK, but be careful of eating anymore than that, especially kidney beans. Beans contain varying amounts of Phytohaemagglutinin, a toxin that is deactivated by cooking, and kidney beans have an especially high level of it. Even 5 raw kidney beans can cause poisoning. Look it up. It will be worth it. I used to use whey as mentioned in Sally Fallon’s book and Weston Price Foundation. Then I began to read on blogs that they no longer recommend they acidic whey. Have you read that anywhere? I have not Eileen, but I just skimmed NT and she mentions “some varieties in acidic water and some in neutral or slightly alkaline water.” I’m thinking that the no-whey comments were specific to a type of bean, rather than a broad statement. That’s just an idea though, since I haven’t heard that myself. This is great! For the record – I do really crave beans sometimes. Especially for breakfast. Is that super bizarre? Tell me it’s not crazy! I recently came across another method that calls for soaking in SALT water, then rinsing and soaking again or going straight to the cooking step. It worked really well, and the beans had a tiny bit more flavor and didn’t turn to mush. They cooked a little more evenly too. It was surprising! I don’t know how much salt is actually absorbed so haven’t done it again, but it was a nice experiment! I love beans, too, and at 63 years old, have been eating them forever. I used to soak them and not change the water but I’ve learned that soaking beans and nuts rids them of toxins. My method of doing beans is to let them soak all night then in the morning I rinse them really good and add fresh water and soak them again all day. Around 3:00 a.m. I rinse them again. At this point you may wait until later and rinse and soak again all night but I would put them in the refrigerator again and repeat process in the morning. This makes the beans highly digestable. In the afternoon, I cook them as desired without rinsing off the cooking water and it gives the bean water, or liquor as some call it, a wonderful thick consistency. I love my beans. I make refried beans often. Also before cooking is a good time to divide them in half, freeze the half and cook the rest. Also, I always add some powdered ginger in the palm of my hand and press it our with my finger to rid it of lumps and through it in the bean pot before cooking. No gas! I haven’t heard of the powdered ginger trick Maggie, but I bet the flavor is delicious! I agree that before cooking is a good time to divide, which is why I recommend doing this at the par-cook stage. I froze one when they were completely cooked, and they were too mushy for use in any dish needing whole beans. I soak and cook as these instructions, then can them. You can flavor them as the instructions the Bernardin website gives or just can them in water to be used however you want later. You do need a pressure canner for beans. I’ve canned dry beans but never after soaking. After having soaked the beans, how much beans /water do you use per pint jar. My canning time is 75 minutes for pints, 90 for quarts at 15#. Is it the same for soaked beans? Thank you!!! Same headspace, same timing, but at my altitude I process at 10 lbs pressure. My dh has no enzymes for digesting beans, ate them so much as a kid I guess. Black beans had us in the ER! So I do 4 day soaks and still we have minor issues-but black beans I don’t risk. So why the lemon juice for cooking those? The lemon juice/whey is suggested by Sally Fallon of Nourishing Traditions. She mentions that some beans require acidic, some neutral or some alkaline water, so I’m thinking that the black bean requires the slightly acidic environment. I haven’t read much more on every specific bean though, so if it’s a life/death/ER situation, please makes sure before taking my word on it! I agree with you completely. It is easier to open a can, but I love the frugality of the bean from scratch. I used to try to incorporate beans into our meals once a week, now I shoot for once a day. I don’t always do it, but as it is so frugal and healthy, that’s my goal. I soak my beans during the day and then cook them in the crock pot on low overnight. Easy, healthy, frugal, delicious. I’m pinning this one! Thanks for the post, Tiffany. Thanks so much Heather! Easy, healthy, frugal and delicious. Love the bean. 🙂 Well said!! Consider yourself fortunate Amanda! The gaseous side effect isn’t with everyone. 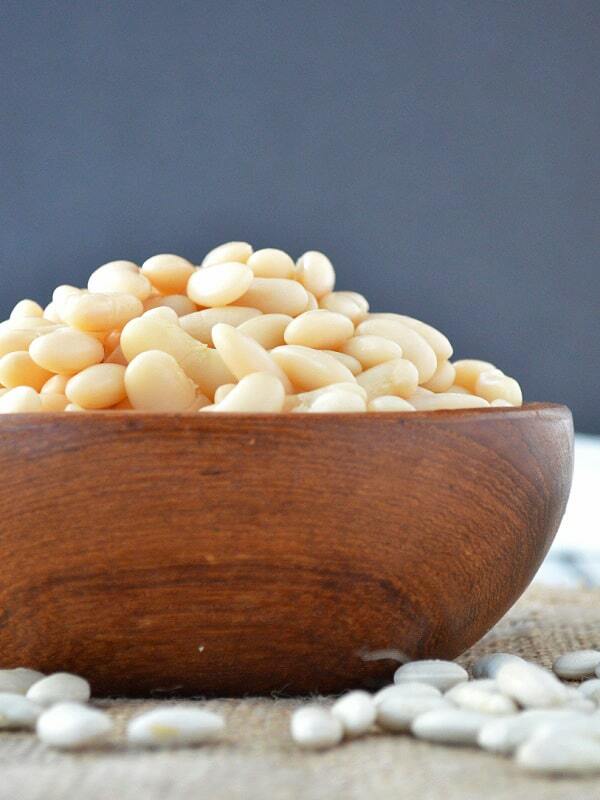 Some people have plenty of the enzymes needed to adequately digest beans, and some don’t – that’s where soaking comes into play. By soaking before hand, you don’t need as much of the digestive enzymes to break them down. I’m a big fan of beans too, and really enjoy northern beans cooked all day with pork and a ham bone. Over cornbread. YUM! Tiffany I just want to say thank you for the great post. We are a family of 6 and need to cut our budget on food dramatically but I do not want to go back to processed food that we just got out of. I have always heard that beans are frugal but it always looked too difficult, I’m going to give this a go, now I just have to find some good frugal dinners that include beans. Considering my husband loves Mexican food I think I’ll start with that but your recipe with the ham bone looks delicious also. You’re most welcome Samantha! Beans really are easy, especially once you figure out the best way to incorporate the process into your routine. It’s not hard, granted, but new is always “different.” I hope to have that ham bone recipe for you soon!! thank you, thank you, thank you!!!! i love beans, but they don’t love me. i made my best beans ever a couple weeks ago and have very bad gas and stomach aches afterwards. i soaked them for 48 hours with ACV, rinsed them, and then cooked them with pork bones and fat — yummy. i noticed that you do a second soak, so i going to try that and see how it works. thanks for sharing! You’re welcome, welcome, welcome!! 🙂 I hope this second soap helps out with the digestion!! My family eats beans all the time. My husband, with 13 children in his family, grew up eating pintos. I soak my beans (all kinds) in water alone in a big bowl on the counter all day. Then at night I put the bowl in the frig. The next morning I drain the water off and cook as normal. Depending on time, I have skipped the overnight frig soak. Doing this both ways is how I discovered that the frig soak kept us from being gassy. I cannot explain the science of it, I just know it works for us. Oh yes, we’d be eating beans like crazy with that many kids too! 😉 I wonder if temperature has something to do with it, or if it’s just a time thing. Interesting for sure Edith! Thanks for sharing!! Thank you for this great post. I’ve been trying to figure this out and after reading several sets of directions, yours makes the most sense. I have to say, I want to grocery shop where you do! I’ve read many of your posts and I’m surprised at how much cheaper groceries are in your lists. I’ve often heard that our area (Billings, Montana) has expensive groceries but didn’t think it was that far off. For example, a can of beans (off brand) are 1.49 here not on sale, a loaf of bread is 2.69 at the big stores like Costco and even higher at the regular grocery stores, and a plain bag of white rice (off brand) is 1.10. Needless to say, we take advantage of Costco for most of our items since buying in bulk helps with most items and we buy at the regular store for things that are cheaper by the unit there. Thanks again for your great posts. I’m glad I stumbled across your site this year. Hi Heather! I’m glad you stumbled across Crumbs too! We definitely have good prices on certain items, but if it’s animal related, all bets are off. That’s part of the reason we get so creative and eat so little meat. Although I hope to use Blythe’s tip above and get some help there! WhereI live black beans are an everyday meal with eggs, over toasted tortilla, on bread … You name it; dinner or breakfast. I usually don’t do the whole beans for dinner because I the gassy side effects, but what I have found is that if they are liquified on a blender, the side effects are waaay less. I put olive oil on the pot with some chopped onion and garlic and put in the blended beans in. Let cook for aprox 30 min and they are done. I guess much like redried beans but a little runnier. You tip about rinsing the second rinsing sounds like a winner! Thank you so much for your tips an ideas on how to stretch our budget, you’ve been an inspiration! I just might try other beans besides the staples ant home. Ohh and I don’t add salt when they are cooking, just because my Mom always told me they get harder, but I do add it after they are done an leave them to boil for a few minutes… Just tradition I guess. Great post. I loved all the information in it, especially the tip about using lemon juice in black beans. I have cooked my own beans from scratch numerous times & have one problem, the skins always seem to be tougher than canned beans. I know this can be an issue with beans that are older, but every package of beans I buy? I use filtered water to soak & cook them, no salt, & I keep having the problem. I have tried adding a pinch of baking soda to them when cooking & it seemed to help a bit. Does anyone else have this problem? Any suggestions are greatly appreciated. I have the same problem with black beans. I’m not sure if it’s high altitude or what but it’s the only besn I buy canned anymore. I was glad to see the lemon juice tip, maybe that will help. Just to say, I never soak lentils or split peas, and I add a handful of one or both to almost any soup I make. Gotta get that protein in where you can when you don’t eat much meat. Quick question… Do I need to add lemon juice to the second soak when making black beans? Or is that only necessary for the first soak? I believe it’s just the first soak Kim, but I’ll double check NT and let you know otherwise! I put my beans to soak in salted water after dinner and in the morning, I rinse and cook them in a pressure cookie for 40 minutes and they turn out perfect every time. I sometimes add soup bones or stew meat during the cooking in the pressure cooker for added flavor and the meat is extra tender. After pressure cooking, I put them in a smaller pan and separately cook the seasonigns that I use (chopped onion, sweet paprika, chicken or vegetable bouillion and some tomato juice) and then mix that with the beans in the smaller pan. i soak 24 hrs on the counter…need the warm air to activate the enzymes and get rid of lectins, etc…starting at night. rinse beans and then add kombu to new water. also onions, garlic and celery, just for taste all of them. usually add ham hock. this way the broth is delicious. cook overnight. divide into containers at brkfst. eat beans and greens with eggs for brkfst! yum. and i eat beans and greens with eggs for brkfst often. then again, I rly flavor up my beans…hamhock, celery, onion, garlic, bay leaves, parsley, pepper, lots of kombu (natural MSG) and after cooking, salt — i drink every drop of the pot likker! Thanks for all the suggestions on how to remove harmful substances from beans! There is another angle in addition to the convenience vs. less expensive consideration, and that is that fresh vs “dead” food. My point of view is Ayurvedic medicine, which maintains that the fresher the food, the healthier it is for us. ANY food from a can was cooked months or perhaps even years ago. It may retain basic nutrients the body needs in a degraded form and will keep you from dying if there is nothing else to eat, but freshly prepared and cooked beans not only taste better than their canned counterparts, they supply “vital energy” that is absent from canned foods. It is possible to experience this difference in health value, but only after eating only fresh foods for some time. Then if you go back to a canned food meal, you will feel like you have eaten sludge or something. Hi! Thanks for this great post, I just pinned it! I also wanted to add to the discussion my own little trick for de-gassing beans. While cooking the beans, put a russet potato in the pot to cook the whole time. I don’t know exactly HOW it works, but it does! I’m guessing the potato soaks up some kind of enzyme in its starches. And hopefully it goes without saying, but don’t eat that potato! I learned this trick from my Dad who grew up eating lots of beans in the South. That’s a GREAT tip! I hadn’t heard of that before, but hey, if it works, it works!! Do you peel the potato, cut it in pieces, or put it in whole? I also used the potato method. It was so effective that I did batches of several kinds and colors. After cooking, dried on towels, froze on cookie sheets, fput in heavy plastic bags for longer term freezing – easy to scoop out needed amounts. Some bags of mixed types for chili- very colorful like a bag of jewels! I found this page on Pinterest and repinned it. I have been looking for recipes to add more beans to our diet (to eat healthier and to save money), but I was worried about how to prep them, having not been raised in a bean-eating family. I found your post very informative and I am so glad you posted storage instructions in the comments as that was intimidating me, as well. I now feel empowered to get this done and currently have two pounds each of black and great northern white beans soaking on the counter for my husband’s Southwest Chicken Chili (I plan to can the chili in convenient pint “serving sizes” for him). Thank you! How do you store the beans once they are cool? Can, freeze, etc? I canned mine using a pressure canner. I’ve started canning beans. I just soak for a couple days in the fridge and then pressure can them. This does make them a tiny bit more expensive though because of the lids and electricity to hear the canner. Ok, I’m planning to make chili next week, and looking forward to trying this with dried kidney beans. Do I still pre-cook beans after soaking before they cook in the chili in the crockpot chili? It depends on how long your chili will cook Allyson. If it’s an all day chili, you can start with par-cooked beans and you should be ok. If it’s a half-day chili, you’ll need to start with cooked beans. I agree with your recommendations on cooking beans, especially with reference to reducing flatulence. I do have a problem with one of your explanations, however. I do not believe that the enzymes in beans can cause flatulence, but rather the indigestible complex sugars beans contain. Thus, my thought is that skimming of scum is for aesthetic purposed, not to reduce flatulence. Because we cannot absorb these complex sugars (oligosaccharides), they remain in our GI tracts, and bacteria that CAN use them ferment them leading to gas-production. If you have evidence that bean ENZYMES themselves cause flatulence, I am eager to know. A new idea to me is that long term soaking not only may leach out the complex sugars, but, by starting the sprouting process, may activate the bean enzymes that break them down. This would suggest that a two day soak, with several rinses, might further reduce flatulence. I cook pinto beans by soaking overnight and cooking in a pressure cooker for an hour and fifteen minutes after the starts rocking. Doesn’t soaking for so long make the beans lose their flavor?? Hi, I am doing this for the first time. Do I cover the beans initially when letting them sit in water for 8-24 hours? LOVE the site! Thankful for helpful comments as well!! You have earned coveted bookmark space on the mobile too! Got to have you when I’m on the go or at the store! THANK YOU! If I cook black beans and then freeze them, will they have an off texture if I use them in something like a salad? I would like to cook some to use on a southwest/taco salad, but don’t want to go to all of the trouble if they will be mushy! Thoughts? Thank you for the quick reply! I will be trying this next month! Help how do you degas yellow split peas? Can you put apple cider vinegar in the pot while they are cooking? Also what’s the rinsing regime again? Hi Lylah – I have only heard of adding acid to black beans. I haven’t cooked much with split peas since I was very young, so I can’t offer much advice, but if you want to soak them again, try it with just water and skip the vinegar. If I’m going to ruin someone, homemade toothpaste is my preferred method! 😉 So glad you found this post Corie – thanks for being a long time reader!! Is it possible to degas using the quick-soak method? I soak my beans by placing them in a pot, covering with enough water, cranking the temp up to high until a rolling boil gets started and cook for 1 minute, and then turn the heat off and let the beans sit for an hour. Then I drain, rinse, refill with water and cook for about 40 minutes. My beans always come out perfect using this method, in terms of being super soft and yummy. Okay, I know this post is older, but I just had to comment. I actually am the type of person that would snack on beans. Or at least, I’ve been known to eat a can of beans for lunch or dinner. Limas, butter beans, northern beans. Yum! That’s so awesome Stephanie! I’ve snacked on crispy garbanzo beans before, and they were pretty good! Hi! Thanks for this article! I just started soaking black beans, but noticed the skin on many of the beans immediately started falling off when I did the rinsing (step 1). I didn’t rinse them for that long, just a minute. I did shake them a bit in the colander. Maybe I shouldn’t have shaken them? Thanks for your help! Hmmm… the skin on SOME of my black beans falls off, but definitely not all. There are so many factors to consider when cooking beans, but perhaps it could be the acid? Hey I love your method of cooking these beans! It has worked very well! However I am just doing black beans for the first time with your recipe and would like to know if I should add the whey or lemon juice on every soak or just the first one…. Just the first one Melissa – so glad this method worked for you! What an awesome post…extremely enjoyable and informative. 🙂 I always have issues with beans but I am going to try your soaking methods along with blending prior to cooking. I am using split mung beans which are used in ayurveda along with rice for a dish called kitchari which is intended for healing and detoxing. Thank you for such a kind comment Soul! 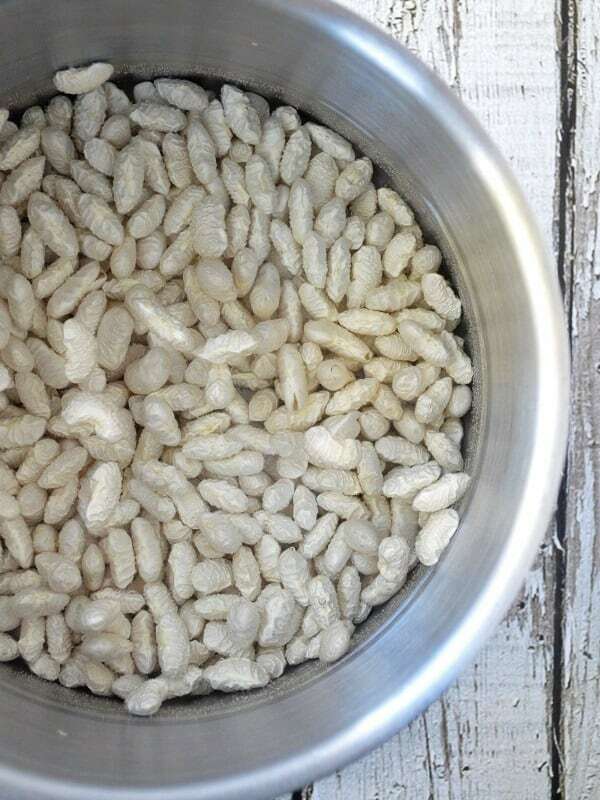 I hope you this method helps with digesting beans – best of luck! Hello Tiffany, I need to know how to cook Pinto beans from a higher altitude. I live in Hemet, CA. I have been told the elevation here is 2,000 to 2,5000 feet. I think they need to cook longer. Can you give me a start to finish receipt on how to cook Pinto beans for a Mexican Dinner. Can I cook them in a Crock Pot? Can I cook them on the gas stove. Stove preferred. How long do I soak them, and how long do I cook them? I really need your help. Thank You. Does the water make a difference in soaking and cooking. Do you put salt in the soak water and in the cooking of the beans. OH Please HELP. Thank You and GOD bless you. Hi Sherry! I’m so sorry, but I don’t have any experience cooking in high altitudes. All the soaking, salting, cook method (crock pot vs. stove) should be the same, but the time will likely be slightly different. I just did the jump and bought 1kg of black beans and they are soaking at the moment. As I do not have such a big pot, I used 2 pots to soak. My question is how do I cook them in a slow cooker? The biggest size I have is a 6.5L pot. Hi Tiffany, so now I have done a first soak for more than 10 hours. So if I use slow cooker, do I go straight to rinsing and then doing a boil over the stove then to slow cooker? Hi Eunice – after soaking, rinse really well, then follow the directions for cooking in a slow cooker. Tiffany, thank you for all your great posts!! I’m in the middle of soaking my beans and just realized I miscalculated my timing. I’m two hours into the second soak…which you suggest doing for 2-8 hours. However, I won’t be able to drain and rinse for 13 hours. Does that matter? You’ve only included the beans in the price of turning dry beans into cooked beans here – not the water and electricity or gas. I’d say dry beans are still far cheaper, but the margin isn’t as large as you state here. Good idea to catch and use the rinsing water for your garden or house plants as well as the soaking water. Thank you, I might try your method, if I run out of kombu seaweed. I learned, that kombu seaweed has enzymes, that are able to break down complex sugars in beans. Unfortunately we humans do not make those enzymes and many of us have trouble with beans fermenting in the intestines and creating gas. Basically I soak beans in room temperature water with some sun dried kombu seaweed in it. Yotube video said to do that for 8 hours, but I did for 2 days -1 on the counter, one in the fridge. Worked amazingly good. Cooked in slow cooker as always from morning till evening on low. No bloating, no gas. I am glad though to have a back up plan. 🙂 I think I will use your idea of making enough for a month and freezing them. I didn’t know I could freeze beans. Are they mushy after they are thawed out. Do you cook them as long. Would like to know how you freeze them. Thank you hope you can reply in email. You sure can Pat! Nope, not mushy and yes you cook them just as long. I portion into 1 1/2 cups into a sandwich baggie, push out all the air and stick in the freezer! I like your suggestions and comments a lot. I bought a two pound bag of navy beans and soaked them so long they started to sprout. I ended up getting a package of Dixie cups and a kitty litter pan and put about 10 beans in each Dixie cup with some soil ( always buy expensive dirt it makes everyone a green thumb). Anyway I cooked the rest of the beans everything came out fine. I like to use the soaking water to water my plants( unseasoned of course) now I am growing the beans and some I will thin out and use as bean sprouts and the rest hopefully will make it to my garden in April. Long ago (probably in Organic Gardening or Mother Earth News) I read that sprouting the beans made them more nutritious and lessened gas problems. It doesn’t take much of a sprout to add the nutrition, including some vitamin C. The tiniest of tails will do. Of course, bean sprouts are a normal ingredient in many Oriental dishes! 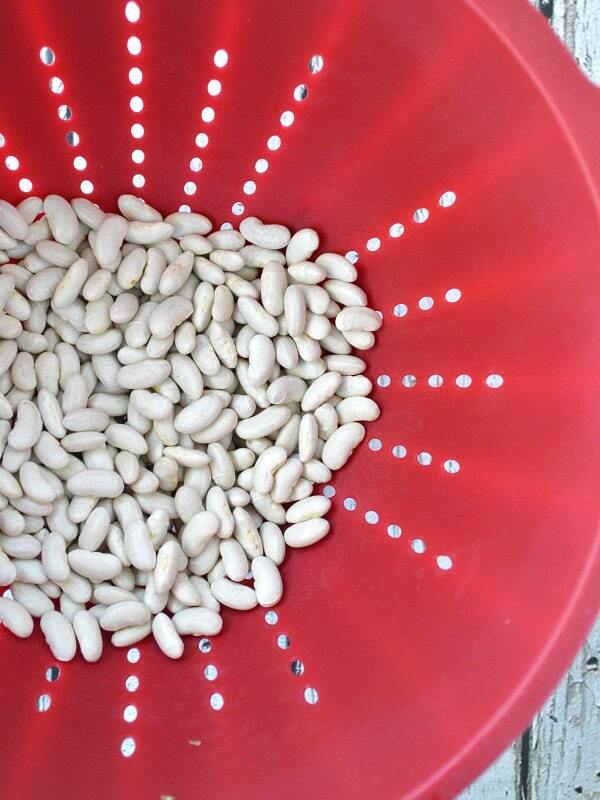 I soak the beans at least 8 hours, then pour them in a plastic colander, and spray rinse them. I cover the colander with a plate or a dish towel, and set it where it can continue to drain. (In the sink, or Inside a big bowl will do.) I rinse them again at least 3 times per day until I see the tails (or until I get tired of fooling with them). Then I cook them as I normally would. No one seems to notice the tiny sprouts. we in India have pressure cooker, which cooks many things at the same time, like we can cook our soaked garbanzo/ Red Kidney beans etc, with rice and vegetables all in one cooker in seperators, or/ vessels placed one on top of the other, and everything would get cooked within 20 minutes. We have had such cookers for ages, and is still the must have thing in our kitchen. Even when we go abroad to live, we never forget to take this all in one pressure cooker with us. Hi Tiffany. I randomly found your site and what a treasure! Thank you for sharing the “science” of dry beans. I have a son with autism and am attempting to grow our own organic foods, ferment, kefir, raw milk (from resource), back yard chickens & ducks for eggs, while trying to eat less meat. Go Beans! Hi Lori! I’ve been cooking beans this way for years, and if the stove is on a simmer (i.e. barely any bubbles) than the beans shouldn’t be mush in 45 minutes. What type of beans did you use? I used Great Northern White beans. All was not lost. I found a recipe for bean dip and used the mushy beans for that. I will try again. I may have soaked them too long the second time. I’m a big fan of cooking beans from scratch–a staple I always have in my refrigerator ready to eat at any meal or just as a snack. And, I thoroughly enjoyed reading your methods. I’ve most often used a slow cooker, but some are just easier on the stove. I have a question for you though; one that I didn’t see covered in your tutorial. You discard the soak water and I get that you want to avoid the gas element, but aren’t the enzymes in the water good for us? I’ve read that a body will get used to that gas and better digest the more you eat beans that way. Do you have any experience with that? I really hate to discard the nutrients. Thank you for the helpful reply Tiffany. While waiting for an answer yesterday, I found a great thread advocating for saving and using the bean water to cook the beans. I did that and I had the best outcome ever. The beans are so tasty and flavorful that I can’t wait to begin another batch. This time I used Great Northern Navy beans and I’m happy to say that I had none of the side effects, which I expected, but wanted to test. I don’t remember where I read it years ago, but I thought it was relative to the enzymes in the gut and after creating the necessary bacteria were able to metabolize the bean gases without causing the common issue. I will see if I can find that because I do not explain it well. But because I eat beans all the time now, I haven’t had that issue for years. I love your website and will keeping reading for all the good ideas you post. The hardness or softness of the cooking water will make a difference in how long it takes to cook beans. The white film left on a crock pot liner after cooking beans is calcium. Wiping it with a cloth dampened with a little vinegar will remove it. I make birracho beans with beer lime juice and the usual igredients. Never got gas. A chef told me that the beer helps. Hii I was wondering: What happens if you second soak the beans for longer than 8 hours? Or else: can you take the beans out of the water after the second soak and then start the cooking process a little later. I messed up my planning and I don’t want to get up in the middle of the night to cook my beans. I sometimes place my soaked beans in a colander and cover with something to keep dust and/or my cats out of them, and let them sprout very tiny tails before I cook them. 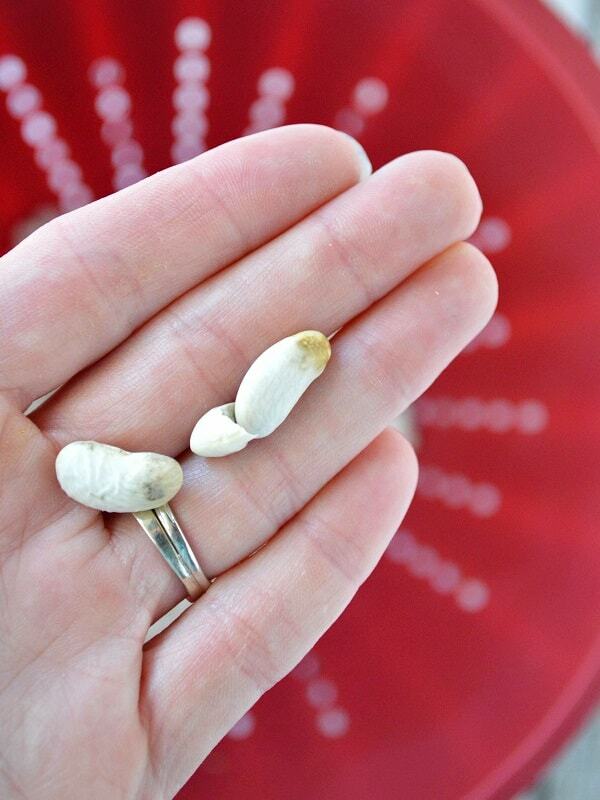 It doesn’t take long for the sprouts to appear – one to 3 days, depending on room temperature, age of beans, etc. I rinse them a few times a day to keep them damp and clean. The sprouting adds vitamins, and lessens the gas, but everything else is the same.